Mr. Twahrwa, a Hutu, is halfway through a six-week government re-education camp set up to purge him and other former fighters of any ethnic ideologies that they may still harbor from 1994, when extremist Hutu massacred 800,000 Tutsi and moderate Hutu. This country, where ethnic tensions were whipped up into a frenzy of killing, is now trying to make ethnicity a thing of the past. There are no Hutu in the new Rwanda. There are no Tutsi either. The government, dominated by the minority Tutsi, has wiped out the distinctions by decree. The re-education camp is one way of driving the point home to people who once lived by the motto ”Hutu power.” As Hutu fighters who fled to Congo after 1994 return to Rwanda they are sent to the camp. Along with civics they are taught some hands-on skills like carpentry. They leave with $75 and, at least in theory, a whole new way of thinking. That new thinking has its critics — those who say that denying that ethnicity exists merely suppresses the painful ethnic dialogue that Rwanda requires. But the government insists that if awareness of ethnic differences can be learned, so can the idea that ethnicity does not exist. Rwanda has an entrenched culture of obedience, and the populace has been quick to pick up on the government’s no-ethnicity policy, at least in conversations with an outsider. Ethnicity has already been ripped out of schoolbooks and rubbed off government identity cards. Government documents no longer mention Hutu or Tutsi, and the country’s newspapers and radio stations, tightly controlled by the government, steer clear of the labels as well. 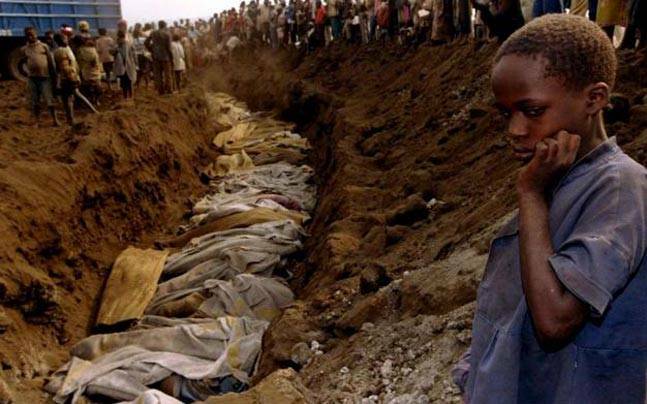 Most dramatic is how Rwanda’s eight million people now shun the identifications that seemed to loom so large 10 years ago as Hutu extremists began their mass killings. It is not just considered bad form to discuss ethnicity in the new Rwanda. It can land one in jail. Added to the penal code is the crime of ”divisionism,” a nebulous offense that includes speaking too provocatively about ethnicity. Rwanda’s approach contrasts markedly with that employed in neighboring Burundi, which has the same ethnic makeup as Rwanda and the same recent history of ethnic violence. Burundi’s transitional government has opted to set aside certain positions for Hutu and certain positions for Tutsi. The two ethnic groups rotate the presidency. A Tutsi held it for 18 months, and now a Hutu fills the seat. Critics argue that Rwanda’s crackdown on ”divisionism” has turned into a way of quashing dissent toward the governing party of President Paul Kagame, who led the Tutsi rebel movement that swept in from Uganda in 1994 to oust the Hutu militias known as Interahamwe, which were responsible for much of the violence. His administration has shut down opposition parties for being too divisive and jailed journalists and activists for the same. The government does not want to hear suggestions that one ethnicity or the other has too much power. Those are divisive thoughts. It is not possible to know, or even discuss, whether the majority Hutu population is well represented in universities. No such records are kept. To try to repair tensions that still linger from 1994, and reduce a huge backlog in the judicial system, Rwanda has created community courts called gacacas. Locals gather together to rehash the killings. They are encouraged to point fingers at suspected killers. The accused are given a chance to stand up and defend themselves, or to apologize. Confessions can sometimes bring the most extraordinary result: a hug from the accuser and an offer of forgiveness. More often, though, there are arguments. At one such court in the Gikondo neighborhood of Kigali, a Hutu man stood up to deny that he was responsible for the dead bodies that were found in his yard during 1994. He said he had just found them there. A man in the crowd challenged him. ”Tell us what happened,” the man said. But the accused, fidgeting with his glasses, stuck to his story. Despite the government’s policy, the terms Hutu and Tutsi do sometimes manage to come to the surface. Mr. Kagame’s main opponent in the election was a Hutu, Faustin Twagiramungu, who overtly appealed to the Hutu majority for support. Mr. Kagame’s government likened his approach to the techniques used by Hutu extremists in 1994 to foment the mass killings, and threatened to jail him. When the Belgians ruled colonial Rwanda they favored the Tutsi over the Hutu and issued identification cards to institutionalize the difference. After Rwanda’s independence, political battles and periodic massacres revolved around the ethnic labels. Still, intermarriage remained common, with children taking on the ethnicity of their father. Physical differences between the two groups blurred. He caught himself and remembered his lessons. ”I see myself as a Rwandan now, because there are no more ethnicities here,” he said. Ethnicity has not been dislodged from peoples’ minds, though. A Tutsi woman, who was raped in 1994 by so many Hutu militiamen in the village of Taba that she lost count, said she has difficulty interacting comfortably with Hutu. ”I don’t trust them,” said the woman, who, identified only as J.J., testified about her ordeal before the international tribunal on Rwanda.